While it is unclear how long Jews have been celebrating with the tradition of lighting candles, archaeologists have found clay chanukiot dating back to the beginning of the Middle Ages. 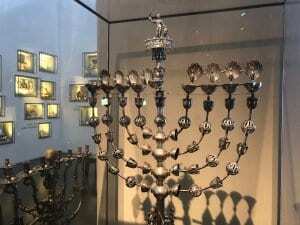 The oldest chanukiah in the collection dates back to the first century. Based on the shape and design of the chanukiot, one can learn a lot about the relationship between Jews and non-Jews in a given place and time. Where Jews were unpopular, the chanukiot tend to be physically small and were not often placed in windows. Where Jews were well-liked, chanukiot are larger, ornately decorated and were often placed outside on the street. For example, the chanukiot from Jerusalem are box-shaped until today, as Jews would place them outside of their homes in the winter weather. The story of Chanukah itself commemorates the miracle of victory and oil the Jews found over two centuries ago in Jerusalem, before the beginning of Christianity. According to a Talmudic legend, Syrian king (Antiochus) made the Jews worship Greek gods and erected a statue of himself in the Second Jewish Temple, ordering them to bow down to it. As the Ten Commandments forbade Jews to worship idols, they refused and the Maccabees rebelled, eventually recapturing Jerusalem from the Syrians. However, the Temple had been destroyed and as they were cleaning and repairing, they rededicated the Temple to God by lighting a lamp (menorah), a symbol of God’s presence. Although just one small jar of oil was found, enough for only one day, the oil miraculously lasted eight days. While the Temple menorah has seven branches (and this type of menorah is prohibited to use outside of the Temple) the Chanukah menorah has eight branches, plus a raised shamash light used to kindle the other lights and commemorate the miracle. Other design elements include the face of the Holy Ark, the candle-lighting blessing or words to the traditional song “Hanerot Hallelu” (“These Candles”) and the image of a cohen (priest) lighting the Temple menorah. 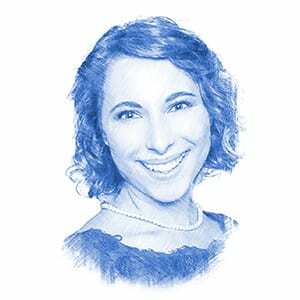 “All of these Jewish symbols enhance the meaning and celebration of Chanukah,” added Sarfati. “It’s a spiritual atmosphere in Israel during Chanukah,” she said. “Here in Jerusalem, walking outside, one can see Chanukah lamps on both sides of the streets.” Although diverse, what unites the chanukiot from around the world, Sarfati posed, is their purpose – to observe the same ritual and law of publicizing the miracle that occurred some 2,500 years ago.